The Suzuki V-Strom 650 has been launched in India, exclusively in the XT variant, for a price of INR 7.46 lakh (ex-showroom Delhi). The adventure tourer is the third model from the company to be locally assembled in the country using CKD kits. The Suzuki V-Strom 650 XT rivals the Kawasaki Versys 650. Bookings for the Suzuki V-Strom 650 XT are already open for a token amount of INR 50,000. The model was showcased at Auto Expo 2018 in February. It will primarily compete with the Kawasaki Versys 650, the upcoming SWM Superdual T and the Benelli TRK 502 among others. 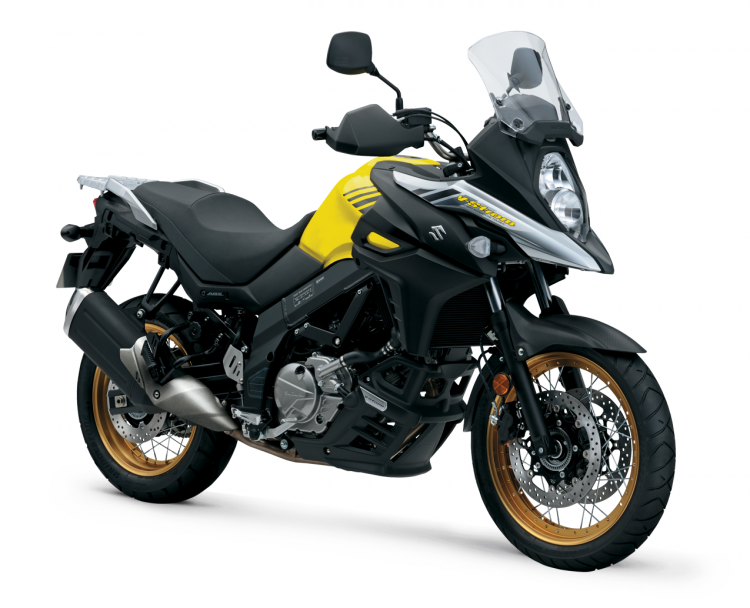 The Suzuki V-Strom 650 shares its design with the flagship Suzuki V-Strom 1000. Globally, it is available in two variants - standard and XT. The Indian-spec XT variant is equipped with dual-purpose Bridgestone Battlax Adventure A40 tubeless tyres that wrap on aluminium wire spoke rims. It has fairing protection guards, engine belly guard and handguards. It comes with a range of optional touring accessories as well, such as hard-plastic panniers with saddle stay and a top-box. The motorcycle has a saddle height of 835 mm, and it tips the scales at 213 kg (kerb). It has a large 20-litre fuel tank and semi-fairing with a high-set windscreen. Electronic wizardry includes switchable traction control, Suzuki Easy Start system, two riding modes and a low-rpm assist. The bike also comes with a 12V DC power socket for charging a Smartphone, navigation systems and the likes. Powering the Suzuki V-Strom 650 XT is a 645 cc, 90-degree V-twin, four-stroke engine with liquid cooling. The fuel-injected motor is capable of churning out a maximum power of 70 bhp at 8,800 rpm and generating a peak torque of 62 Nm at 6,500 rpm. It works in harmony with a 6-speed gearbox with a final chain drive. The claimed fuel economy is 24.3 km/l. The Suzuki V-Strom 650 XT employs a 645 cc, 90-degree V-twin motor that puts out 70 bhp and 62 Nm of torque. 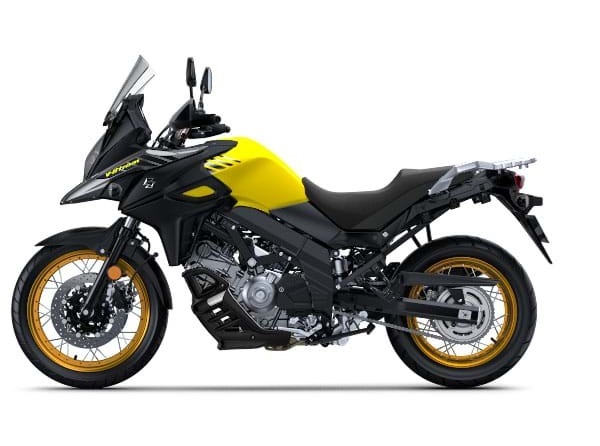 The Suzuki V-Strom 650 XT's suspension hardware comprises telescopic forks at the front and a rebound adjustable rear mono-shock with a remote preload adjuster. Braking force is provided by twin disc brakes at the front and a single rotor at the back. Dual-channel ABS is standard. Two colour options are available in our market: Champion Yellow Color No. 2 and Pearl Glacier White.